(1) “All the Tired Horses” is a gorgeous piece of music, perhaps the most memorable song on this album. In an older form it was “All the Pretty Ponies in the Yard”; now it could serve as the theme song to any classic western. Can you hear the organ standing in between the beautiful strings and voices? Shane comes into view, and The Magnificent Seven: gunmen over the hill and out of time still got to ride. It sounds like Barbara Stanwyck in Forty Guns singing, as a matter of fact. The beauty of this painted signpost promises what its words belie, and the song’s question becomes the listener’s: he can’t ride when the horse is asleep in the meadow. (2) After a false beginning comes “Alberta #1,” an old song now claimed by Dylan. One line stands out: “I’ll give you more gold than your apron can hold.” We’re still at the frontier. The harmonica lets you into the album by its nostalgia, and it’s the song’s promise that matters, not the song itself, which fades. “What was it?” said a friend, after we’d heard thirty minutes of Self Portrait for the first time. “Were we really that impressionable back in ’65, ’66? Was it that the stuff really wasn’t that good, that this is just as good? Was it some sort of accident in time that made those other records so powerful, or what? (3) Something like a mood collapses with the first Nashville offering, “I Forgot More Than You’ll Ever Know,” a slick exercise in vocal control that fills a bit of time. After getting closer and closer to the Country Music Capitol of the World—and still keeping his distance with Nashville Skyline, one of the loveliest rock and roll albums ever made—the visitor returns to pay his compliments by recording some of their songs. How does it sound? It sounds alright. He’s sung himself into a corner. It sounds alright. Sign up the band. (4) “Days of ’49” is a fine old ballad. Dylan’s beginning is utterly convincing, as he slips past the years of the song (listen to the vaguely bitter way he sings “But what cares I for praise?”). He fumbles as the song moves on, and the cut collapses, despite the deep burr of the horns and the drama generated by the piano. It’s a tentative performance, a warm-up, hardly more than a work tape. The depths of the history the song creates—out of the history of pathos Johnny Cash gave “Hardin Wouldn’t Run” (sounding like it was recorded in the shadows of an Arizona canyon) or “Sweet Betsy from Pike”—has been missed. The song is worth more effort than it was given. “It’s hard,” he said. “It’s hard for Dylan to do anything real, shut off the way he is, not interested in the world, maybe no reason why he should be. Maybe the weight of the days is too strong, maybe withdrawal is a choice we’d make if we could…” One’s reminded that art doesn’t come—perhaps that it can’t be heard—in times of crisis and destruction; art comes in the period of decadence that precedes a revolution, or after the deluge. It’s prelude to revolution; it’s not contemporary with it save in terms of memory. But in the midst of it all artists sometimes moves in to recreate history. That takes ambition. (5) When you consider how imaginative the backing on other Dylan records has been, the extremely routine quality of most of the music on Self Portrait can become irritating. It is so uninteresting. “Early Mornin’ Rain” is one of the most lifeless performances of the entire album; a rather mawkish song, a stiff well-formed-vowel vocal and a vapid instrumental track that has all the flair of canned laughter. The Four Questions: The four sons gazed at the painting on the museum wall. “It’s a painting,” said the first son. “It’s art,” said the second son. “It’s a frame,” said the third son, and he said it rather coyly. The fourth son was usually considered somewhat stupid, but he at least figured out why they’d come all the way from home to look at the thing in the first place. “It’s a signature,” he said. (6) “In Search of Little Sadie” is an old number called “Badman’s Blunder” (or sometimes “Badman’s Ballad” and sometimes “Little Sadie”) that Dylan now claims as his own composition. As with “Days of ’49,” the song is superb—it’s these kinds of song that seem like the vague source of the music the Band makes—and what Dylan is doing with the tune, leading it on a switchback trail, has all sorts of possibilities. But again, the vocal hasn’t been given time to develop and the song loses whatever power it might have had to offer, until the final chorus, when Bob takes off and does some real singing. This bit about getting it all down in one or two takes only works if you get it all down. Otherwise it’s at best “charming” and at worst boring, alluding to a song without really making music. Imagine a kid in his teens responding to Self Portrait. His older brothers and sisters have been living by Dylan for years. They come home with the album and he simply cannot figure out what it’s all about. To him, Self Portrait sounds more like the stuff his parents listen to than what he wants to hear; in fact, his parents have just gone out and bought Self Portrait and given it to him for his birthday. He considers giving it back for Father’s Day. To this kid Dylan is a figure of myth; nothing less, but nothing more. Dylan is not real and the album carries no reality. He’s never seen Bob Dylan; he doesn’t expect to; he can’t figure out why he wants to. (7) The Everly Brothers version of “Let It Be Me” is enough to make you cry, and Bob Dylan’s version is just about enough to make you listen. For all of the emotion usually found in his singing, there is virtually none here. It is a very formal performance. (8) “Little Sadie” is an alternate take of “In Search of… ” I bet we’re going to hear a lot of alternate takes in the coming year, especially from bands short on material who want to maintain their commercial presence without working too hard. Ordinarily, when there are no striking musical questions at stake in the clash of various attempts—alternate takes have been used as a graveyard rip-off to squeeze more bread out of the art of dead men or simply to fill up a side. “Little Sadie” fills up the side nicely. (9) “Woogie Boogie” is fun. The band sounds like it’s falling all over itself (or maybe slipping on its overdubs) but they hold on to the beat. There is as much of Dylan’s feel for music here as on anything else on Self Portrait. If you were a producer combing through a bunch of Self Portrait tapes for something to release, you might choose “Woogie Boogie” as a single—backing “All the Tired Horses,” of course. Self Portrait most closely resembles the Dylan album that preceeded it: Great White Wonder. The album is a two-record set masterfully assembled from an odd collection of mostly indifferent recordings made over the course of the last year, complete with alternate takes, chopped endings, loose beginnings, side comments, and all sorts of mistakes. Straight from the can to you, as it were. A bit from Nashville, a taste of the Isle of Wight since you missed it, some sessions from New York that mostly don’t make it, but dig, it’s Dylan, and if you wanted Great White Wonder and Stealin’ and John Birch and Isle of Wight and A Thousand Miles Behind, Self Portrait will surely fill the need. I don’t think it will. It’s true that all of the bootlegs (and the Masked Marauders, which was a fantasy bootleg) came out in the absence of new music from Dylan, but I think their release was related not to the absence of his recordings but to the absence of the man himself. We are dealing with myth, after all, and the more Dylan stays away the greater the weight attached to anything he’s done. When King Midas reached out his hand everything he touched not only turned to gold, it became valuable to everyone else, and Dylan still has the Midas touch even though he’d rather not reach out. It is only in the last two years that the collecting of old tapes by Dylan has really become a general phenomena, and there are many times more tapes in circulation than are represented on the bootlegs. There is a session with the Band from December of 1965, live albums, ancient recordings, tapes of Dylan at the Guthrie Memorial, with the Band last summer in Missouri, radio shows from the early Sixties, the live “Like a Rolling Stone.” It sometimes seems as if every public act Dylan ever made was recorded, and it is all coming together. Eventually, the bootleggers will get their hands on it. Legally, there is virtually nothing he can do to stop it. He can head off the theft and sale of his first drafts, his secrets, and his memories only with his music. And it is the vitality of the music that is being bootlegged that is the basis of its appeal. The noise of it. Self Portrait, though it’s a good imitation bootleg, isn’t nearly the music that Great White Wonder is. “Copper Kettle” is a masterpiece but “Killing Me Alive” will blow it down. Nashville Skyline and John Wesley Harding are classic albums; but no matter how good they are they lack the power of the music Dylan made in the middle Sixties. Unless he returns to the marketplace, with a sense of vocation and the ambition to keep up with his own gifts, the music of those years will continue to dominate his records, whether he releases them or not. If the music Dylan makes doesn’t have the power to enter into the lives of his audience—and Self Portrait does not have that power—his audience will take over his past. (10) Did Dylan write “Belle Isle”? Maybe he did. This is the first time I’ve ever felt cynical listening to a new Dylan record. In the record industry music is referred to as “product.” “We got Beatle product.” When the whirlwind courtship of Johnny Winter and Columbia was finally consummated everyone wanted to know when they would get product. They got product fast but it took them a while longer to get music. Such is show biz, viz. Self Portrait, which is already a triple gold record, the way “O Captain! My Captain!” is more famous than “When Lilacs Last in the Dooryard Bloom’d,” is the closest thing to pure product in Dylan’s career, even more so than Greatest Hits, because that had no pretensions. The purpose of Self Portrait is mainly product and the need it fills is for product—for “a Dylan album”—and make no mistake about it, the need for product is felt as deeply by those who buy it, myself included, of course, as by those who sell it, and perhaps more so. As a throw-together album it resembles Flowers; but it’s totally unlike Flowers in that the album promises to be more than it is, rather than less. By its title alone Self Portrait makes claims for itself as the definitive Dylan album—which it may be, in a sad way—but it is still something like an attempt to delude the public into thinking they are getting more than they are, or that Self Portrait is more than it is. (11) “Living the Blues” is a marvelous recording. All sorts of flashes of all sorts of enthusiasms spin around it: The Dovells cheering for the Bristol Stomp, Dylan shadow-boxing with Cassius Clay, Elvis smiling and sneering in “Jailhouse Rock.” The singing is great—listen to the way Bob fades off “deep down insyyy-hide,” stepping back and slipping in that last syllable. For the first time on this album Dylan sounds excited about the music he’s making. The rhythm section, led by the guitar and the piano that’s rolling over the most delightful rock and roll changes, is wonderful. The girls go through their routine and they sound—cute. Dylan shines. Give it 100. (12) “Like A Rolling Stone”—Dylan’s greatest song. He knows it, and so do we. Not only that, but the greatest song of our era, on that single, on Highway 61 Revisited, on the tape of a British performance with the Hawks in 1966. If one version is better than the other it’s like Robin Hood splitting his father’s arrow. “Can you keep up with this train?” The train no longer runs; I suppose it depends on where your feet are planted. Dylan from the Isle of Wight is in your living room and Dylan is blowing his lines, singing country flat, up and down, getting through the song somehow, almost losing the whole mess at the end of the second verse. You don’t know whether he dropped the third verse because he didn’t want to sing it or because he forgot it. It’s enough to make your speakers wilt. Self Portrait enforces or suggests a quiet sound. “Like a Rolling Stone” isn’t “Blue Moon” but since most of Self Portrait is more like “Blue Moon” than “Like a Rolling Stone,” and since it is a playable album that blends together, you set the volume low. But if you play this song loud—really loud, until it distorts and rumbles—you’ll find the Band is still playing as hard as they can, for real. The strength cut in half by the man who recorded it, but volume will bring it back up. Some of “Like a Rolling Stone” is still there. A splendid beginning, announcing a conquest; Levon Helm beating his drums over the Band’s Motown March (ba-bump barrummmp, ba-bump barrrummmp), smashing his cymbals like the glass-breaking finale of a car crash; and best of all, Garth Hudson finding the spirit of the song and holding it firm on every chorus. Near the end when the pallid vocalizing is done with Dylan moves back to the song and he and the Band begin to stir up a frenzy that ends with a crash of metal and Bob’s shout: “JUST LIKE A ROLLING STONE!” There is something left. 1965: “BAM! Once upon a time…” The song assaults you with a deluge of experience and the song opens up the abyss. “And just how far would you like to go in?” “Not too far but just far enough so’s we can say we’ve been there.” That wasn’t good enough. “When you gaze into the abyss, the abyss looks back at you.” It peered out through “Wheel’s On Fire” and “All Along the Watchtower,” but it seems Dylan has stepped back from its edge. The abyss is hidden away now, like the lost mine of a dead prospector. “Like a Rolling Stone,” as we hear it now, is like a fragment of a faded map leading back to that lost mine. I once said I’d buy an album of Dylan breathing heavily. I still would. But not an album of Dylan breathing softly. (13) Why does “Copper Kettle” shine (it even sounds like a hit record) when so many other cuts hide in their own dullness? Why does this performance evoke all kinds of experience when most of Self Portrait is so one-dimensional and restrictive? Why does “Copper Kettle” grow on you while the other songs disappear? What matters most is Bob’s singing. He’s been the most amazing singer of the last ten years, creating his language of stress, fitting five words into a line of ten and ten into a line of five, shoving the words around and opening up spaces for noise and silence that through assault or seduction or the gift of good timing made room for expression and emotion. Every vocal was a surprise. You couldn’t predict what it would sound like. The song itself, the structure of the song, was barely a clue. The limits were there to be evaded. On “Copper Kettle” that all happens, and it is noticeable because this is the only time on Self Portrait that it happens. “Not all great poets—like Wallace Stevens—are great singers,” Dylan said a year ago. “But a great singer—like Billie Holiday—s always a great poet.” That sort of poetry—and it’s that sort of poetry that made Dylan seem like a “poet”—is all there on “Copper Kettle,” in the way Bob changes into the lines “… or ROTTEN wood…” fading into “(they’ll get you) by the smo-oke…” The fact that the rest of the album lacks the grace of “Copper Kettle” isn’t a matter of the album being “different” or “new.” It is a matter of the music having power, or not having it. “… very highly successful in terms of money. Dylan’s concerts in the past have been booked by his own firm, Ashes and Sand, rather than by [this is from Rolling Stone, December 7th, 1968] private promoters. Promoters are now talking about a ten city tour with the possibility of adding more dates, according to Variety. And we’d just sit there and stare. (15) We take “Blue Moon” as a joke, a stylized apotheosis of corn, or as further musical evidence of Dylan’s retreat from the pop scene. But back on Elvis’ first album, there is another version of “Blue Moon,” a deep and moving performance that opens up the possibilities of the song and reveals the failure of Dylan’s recording. There is nothing banal about “Blue Moon.” In formal musical terms, Dylan’s performance is virtually a cover of Elvis’ recording, but while one man sings toward the song, the other sings from behind it, from the other side. (16) “The Boxer”: remember “How I Was Robert MacNamared Into Submission,” or whatever it was called, with that friendly line, “I forgot my harmonica, Albert?” Or Eric Anderson’s “The Hustler”? Maybe this number means “no hard feelings.” Jesus, it is awful. Would Self Portrait make you want to meet Dylan? No? Perhaps it’s there to keep you away? (17) “The Mighty Quinn” sounds as if it was a gas to watch. It’s pretty much of a mess on record, and the sound isn’t all that much better than the bootleg. The Isle of Wight concert was originally planned as an album, and it’s obvious why it wasn’t released as such—on tape, it sounded bad. The performances were mostly clumsy or languid and all together would have made a lousy record. Two of the songs had something special about them, on the evidence of the bootleg, though neither of them made it to Self Portrait. One was “Highway 61 Revisited,” where Bob and the Band screamed like Mexican tour guides hustling customers for a run down the road: “OUT ON HIGHWAY SIXTY-ONE!” The other was “It Ain’t Me Babe.” Dylan sang solo, playing guitar like a lyric poet, transforming the song with a new identity, sweeping in and out of the phrases and the traces of memory. He sounded something like Billie Holiday. It’s certainly a rather odd “self portrait”: other people’s songs and the songs of a few years ago. If the title is serious, Dylan no longer cares much about making music and would just as soon define himself on someone else’s terms. There is a curious move toward self-effacement; Dylan removing himself from a position from which he is asked to exercise power in the arena. It’s rather like the Duke of Windsor abdicating the throne. After it’s over he merely goes away, and occasionally there’ll be a picture of him getting on a plane somewhere. (18) “Take Me As I Am Or Let Me Go.” The Nashville recordings of Self Portrait, taken together, may not be all that staggering but they are pleasant—a sentimental little country melodrama. If the album had been cut to “Tired Horses” at the start and “Wigwam” at the end, with the Nashville tracks sleeping in between, we’d have a good record about which no one would have gotten very excited one way or the other, a kind of musical disappearing act. But the Artist must make a Statement, be he Bob Dylan, the Beach Boys, or Tommy James and the Shondells. He must enter the studio and come out with that masterpiece. If he doesn’t, or hasn’t bothered, there’ll be at least an attempt to make it look as if he had. If Dylan was releasing more music than he’s been—a single three times a year, an album every six months or so—then the weight that fixes itself on whatever he does release would be lessened. But the pattern is set now, for the biggest stars—one a year, if that. It’s rather degrading for an artist to put out more than one album a year, as if he has to keep trying, you know? Well, three cheers for John Fogerty. Because of what happened in the middle Sixties, our fate is bound up with Dylan’s whether he or we like it or not. Because Highway 61 Revisited changed the world, the albums that follow it must—but not in the same way, of course. (19) “Take a Message To Mary”: the backing band didn’t seem to care much about the song, but Dylan did. My ten-year-old nephew thought “It Hurts Me Too” sounded fake but he was sure this was for real. Ralph Gleason: “There was this cat Max Kaminsky talks about in his autobiography who stole records. He stole one from Max. He had to have them, you know? Just had to have them. Once he got busted because he heard this record on a juke box and shoved his fist through the glass of the box trying to get the record out. You wouldn’t steal Self Portrait? It wouldn’t steal you either. Perhaps that’s the real tragedy, because Dylan’s last two albums were art breaking and entering into the house of the mind. (20) Songwriting can hardly be much older than song-stealing. It’s part of the tradition. It may even be more honorable than outright imitation; at least it’s not as dull. Early in his career, Bob Dylan, like every other musician on the street with a chance to get off it, copped one or two old blues or folk songs, changed a word or two, and copyrighted them (weirdest of all was claiming “That’s All Right,” which was Elvis’ first record and written—or at least written down – by Arthur Crudup). As he developed his own genius Dylan also used older ballads for the skeletons of his own songs: “Bob Dylan’s Dream” is a recasting of “Lord Franklin’s Dream”; “I Dreamed I Saw St. Augustine” finds its way back to “I Dreamed I Saw Joe Hill.” “Pledging My Time” has the structure, the spirit, and a line from Robert Johnson’s “Come On In My Kitchen”; “Don’t the moon look lonesome, shining through the trees,” is a quote from an old Jimmy Rushing blues. “Subterranean Homesick Blues” comes off of Chuck Berry’s “Too Much Monkey Business.” This is a lovely way to write, and to invite, history, and it is part of the beauty and the inevitability of American music. But while Dylan may have added a few words to “It Hurts Me Too,” from where he sits, it’s simply wrong to claim this old blues, recorded by Elmore James among others, as his own. That Self Portrait is characterized by borrowing, lifting, and plagiarism simply means Bob will get a little more bread and thousands of kids will get a phony view of their own history. The mythical immediacy of everything Dylan does and the relevance of that force to the way we live our lives is rooted in the three albums and the two incredible singles he released in 1965 and 1966: Bringing It All Back Home, Highway 61 Revisted, Blonde on Blonde, “Like a Rolling Stone” and “Subterranean Homesick Blues.” Those records defined and structured a crucial year—no one has ever caught up with them and most likely no one ever will. What happened then is what we always look for. The power of those recordings and of the music Dylan was making on stage, together with his retreat at the height of his career, made Dylan into a legend and virtually changed his name into a noun. Out of that Dylan gained the freedom to step back and get away with anything he chose to do, commercially and artistically. The fact that more than a year now separates one album from another heightens their impact, regardless of how much less they have to offer than the albums which established this matrix of power in the first place. In a real way, Dylan is trading on the treasure of myth, fame, and awe he gathered in ’65 and ’66. In mythical terms, he doesn’t have to do good, because he has done good. One wonders, in mythical terms of course, how long he can get away with it. (21) “Minstrel Boy” is the best of the Isle of Wight cuts; it rides easy. (22) The Band plays pretty on “She Belongs To Me” and Dylan runs through the vocal the way he used to hurry through the first half of a concert, getting the crowd-pleasers out of the way so he could play the music that mattered. Garth Hudson has the best moment of the song. Vocation as a Vocation: Dylan is, if he wants to be, an American with a vocation. It might almost be a calling—the old Puritan idea of a gift one should live up to—but it’s not, and vocation is strong enough. There is no theme richer for the American artist than the spirit and the themes of the country and the country’s history. We have never figured out what this place is about or what it is for, and the only way to even begin to answer those questions is to watch our movies, read our poets, our novelists, and listen to our music. Robert Johnson and Melville, Hank Williams and Hawthorne, Bob Dylan and Mark Twain, Jimmie Rodgers and John Wayne. America is the life’s work of the American artist because he is doomed to be an American. Dylan has a feel for it; his impulses seem to take him back into the forgotten parts of our history, and even on Self Portrait, there is a sense of this vocation; Bob is almost on the verge of writing a western. But it’s an ambitious vocation and there is not enough of that, only an impulse without the determination to follow it up. Dylan has a vocation if he wants it; his audience may refuse to accept his refusal unless he simply goes away. In the midst of that vocation there might be something like a Hamlet asking questions, old questions, with a bit of magic to them; but hardly a prophet, merely a man with good vision. (23) “Wigwam” slowly leads the album to its end. Campfire music, or “3 AM, After the Bullfight.” It’s a great job of arranging, and the B-side of the album’s second natural single, backing “Living the Blues.” “Wigwam” puts you to bed, and by that I don’t mean it puts you to sleep. Now Dylan has been approached this way for years, whether or not the word was used, and while in the end it may be the least interesting way to listen to his music it’s occasionally a lot of fun and a game that many of us have played (for example, on “Days of ’49” Dylan sings the line “just like a roving sign” and I just can’t help almost hearing him say “just like a rolling stone” and wondering if he avoided that on purpose). One writer, named Alan Weberman has devoted his life to unraveling Dylan’s songs in order to examine the man himself; just as every artist once had his patron now every auteur has his critic, it seems. (24) Self Portrait is a concept album from the cutting room floor. It has been constructed so artfully, but as a coverup, not a revelation. Thus “Alberta #2” is the end, after a false ending, just as “Alberta #1” was the beginning, after a false beginning. The song moves quickly, and ends abruptly. These alternate takes don’t just fill up a side, they set up the whole album, and it works, in a way, because I think it’s mainly the four songs fitted in at the edges that make the album a playable record. With a circle you tend to see the line that defines it, rather than the hole in the middle. Self Portrait, The Auteur, And Home Movies, Cont. 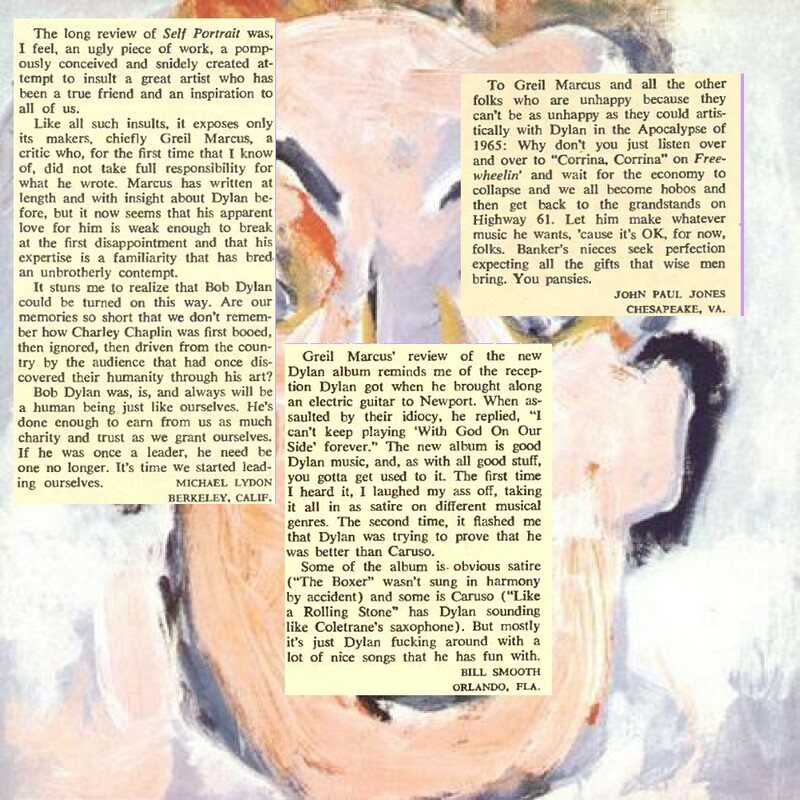 : We all play the auteur game: We went out and bought Self Portrait not because we knew it was great music—it might have been but that’s not the first question we’d ask—but because it was a Dylan album. What we want, though, is a different matter—and that’s what separates most people from auteurists—we want great music, and because of those three albums back in ’65 and ’66, we expect it, or hope for it. I wouldn’t be dwelling on this but for my suspicion that it is exactly a perception of this approach that is the justification for the release of Self Portrait, to the degree that it is justified artistically (the commercial justification is something else—self-justification). The auteur approach allows the great artist to limit his ambition, perhaps even to abandon it, and turn inward. To be crude, it begins to seem as if it is his habits that matter, rather than his vision. If we approach art in this fashion, we degrade it. Take that second song on John Wesley Harding, “As I Went Out One Morning,” and two ways of hearing it. Weberman has determined a fixed meaning for the song: It relates to a dinner given years ago by the Emergency Civil Liberties Committee at which they awarded Bob Dylan their Thomas Paine prize. Dylan showed up, said a few words about how it was possible to understand how Lee Harvey Oswald felt, and got booed. “As I Went Out One Morning,” according to Weberman, is Dylan’s way of saying he didn’t dig getting booed. I sometimes hear the song as a brief journey into American history; the singer out for a walk in the park, finding himself next to a statue of Tom Paine, and stumbling across an allegory: Tom Paine, symbol of freedom and revolt, coopted into the role of Patriot by textbooks and statue committees, and now playing, as befits his role as Patriot, enforcer to a girl who runs for freedom—in chains, to the South, the source of vitality in America, in America’s music—away from Tom Paine. We have turned our history on its head; we have perverted our own myths. Now it would be astonishing if what I’ve just described was on Dylan’s mind when he wrote the song. That’s not the point. The point is that Dylan’s songs can serve as metaphors, enriching our lives, giving us random insight into the myths we carry and the present we live, intensifying what we’ve known and leading us toward what we never looked for, while at the same time enforcing an emotional strength upon those perceptions by the power of the music that moves with his words. Weberman’s way of hearing, or rather seeing, is more logical, more linear, and perhaps even “correct,” but it’s sterile. Mine is not an answer but a possibility, and I think Dylan’s music, is about possibilities, rather than facts, like a statue that is not an expenditure of city funds but a gateway to a vision. If we are to be satisfied with Self Portrait we may have to see it in the sterile terms of the auteur, which in our language would be translated as “Hey, far out, Dylan singing Simon and Garfunkel, Rodgers and Hart, and Gordon Lightfoot…” Well, it is far out, in a sad sort of way, but it is also vapid, and if our own untaught perception of the auteur allows us to be satisfied with it, we degrade our own sensibilities and Dylan’s capabilities as an American artist as well. Dylan did not become a force whose every movement carries the force of myth by presenting desultory images of his own career as if that was the only movie that mattered—he did it by taking on the world, by assault, and by seduction. This entry was posted in Album Reviews and tagged Bob Dylan, Greil Marcus, Rolling Stone. Bookmark the permalink.